Full title: "Tom and Jeremy's Oh No! 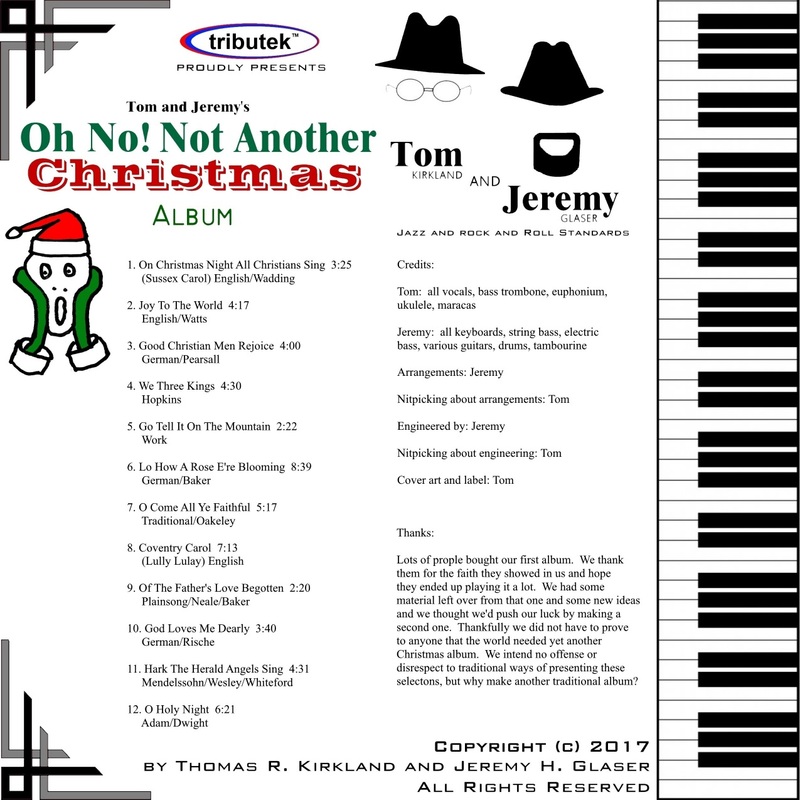 Not Another Christmas Album"
Tom Kirkland and Jeremy Glaser have been friends since 2007 but did not start performing together as a duo until 2014. Since that time they have made numerous public and private appearances in and near the Fox Valley area of Illinois. They usually perform standards as a vocal/piano duo augmented by Tom's bass trombone solos. This album, produced in 2017, is an artistic departure for them as they explored various styles and became a multi-piece group in the studio. Tom was a music education major who switched to engineering and graduated college with a degree in industrial management. Most of his career has been spent in the industrial machinery business. His instruments are voice, all low brass and keyboards. He recently rediscovered ukulele. He is a composer and arranger of both volume and variety. Tom and Jeremy play a number of gigs each month together, and Jeremy also performs on solo piano. Tom is a member of the Fox Valley Concert Band and Fox Valley Philharmonic Orchestra. He can also be found from time to time in community theater pit orchestras, community bands and brass ensembles. Jeremy plays professionally both as a pianist and bassist. Both Tom and Jeremy are also church musicians. TOM AND JEREMY'S OH NO! NOT ANOTHER CHRISTMAS ALBUM comes in a zip archive of 39527K including twelve mp3 files, three jpg files, and one ini file.